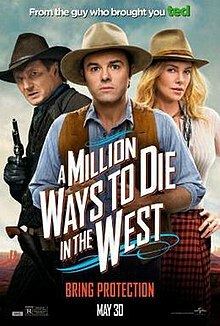 A Million Ways to Die in the West is a 2014 American western comedy film directed by Seth MacFarlane, who wrote the screenplay with Alec Sulkin and Wellesley Wild. The film features an ensemble cast including MacFarlane, Charlize Theron, Amanda Seyfried, Neil Patrick Harris, Giovanni Ribisi, Sarah Silverman, and Liam Neeson. The film follows Albert Stark (MacFarlane) who feels certain that the western frontier is trying to kill him while coping from his break-up with his girlfriend. However, a pistol-packing woman named Anna (Theron) rides into town and helps Albert find his inner courage. Then Stark must put his newfound bravery to the test when Anna's outlaw husband arrives with plans to plant him in an unmarked grave. Development for A Million Ways to Die in the West began while MacFarlane and co-writers Sulkin and Wild were watching western movies during the development of Ted. Casting was done between December 2012 and March 2013. Filming began on May 6, 2013, in various locations in New Mexico including Alburquerque and Santa Fe, and it concluded on August 9 that year. Joel McNeely composed the score and Media Rights Capital, Fuzzy Door Productions, and Bluegrass Films produced the film. The film was released on May 30, 2014, in the United States, and distributed worldwide by Universal Pictures. The film received mixed to negative reviews from critics, with criticism directed toward the film's length and MacFarlane's performance. The film was number three at the box office during its opening weekend and grossed over $87 million worldwide against a budget of $40 million. It was released on DVD and Blu-ray on October 7, 2014, and earned more than $15 million in home media sales. Later at the Fair, the proprietor of a racist shooting game called "Runaway Slave" asks who would like to take a shot. Django (Jamie Foxx) steps up and shoots the man while commenting that "people die at the fair". Christopher Hagen as George Stark, Albert's abusive father. Ewan McGregor as a cowboy who laughed with Foy at Albert's expense at the fair. Kaley Cuoco (uncredited, unrated version only) as a woman that Albert tries to pick up in a store. Patrick Stewart (uncredited voice) as a sheep with long legs that was seen in Albert's drug trip. A Million Ways to Die in the West originated as an inside joke between MacFarlane and co-writers Sulkin and Wild, while they were watching Hang 'Em High. The joke evolved into "riffing on the idea of how dull, depressing, and dangerous it must have been to live in the Wild West." MacFarlane, a lifelong fan of westerns, began researching the topic, using Jeff Guinn's nonfiction novel, The Last Gunfight: The Real Story of the Shootout at the O.K. Corral—And How It Changed the American West as an "invaluable resource," and basis for many of the ways of dying in the film. Various aspects of the film were inspired by western films. The decision to make Albert a sheep herder was inspired by Montana (1950) and his average, non-confrontational demeanor by 3:10 to Yuma (1957). Other westerns that inspired MacFarlane and the crew during writing included Oklahoma! (1955), The Man Who Shot Liberty Valance (1962), and El Dorado (1966). The film was first announced on December 3, 2012, marking MacFarlane's second foray into live-action directing, after 2012's Ted. On January 30, 2013, it was announced that Charlize Theron had joined the film. Theron later revealed that she "begged" for her role, as she wanted the opportunity to work in comedy. On February 11, it was announced Amanda Seyfried had joined the film. On March 6, it was announced Liam Neeson and Giovanni Ribisi had joined the film. Neeson, who nearly always suppresses his Irish accent when acting, agreed to play the part of Clinch only on the condition that he could use his Irish accent. In an interview on The Tonight Show Starring Jimmy Fallon, Neeson remarked that he made this demand because an episode of MacFarlane's Family Guy had previously made a joke out of the juxtaposition of Neeson playing a cowboy with an Irish accent. On March 18, it was announced that Sarah Silverman was cast to play a prostitute in the film. On May 10, it was announced that the film would be co-financed by Media Rights Capital and Fuzzy Door Productions, along with Bluegrass Films and distributed by Universal Studios. On May 11, 2013, it was announced that Neil Patrick Harris had joined the film. On May 29, 2013, MacFarlane announced that Bill Maher had joined the cast. On February 21, 2014, he announced that Gilbert Gottfried had also joined the cast. On May 16, 2014, the film had its world premiere at the Regency Village Theater in Los Angeles. The film was later released nationwide on May 30, 2014. The film was produced by Media Rights Capital, Fuzzy Door Productions, and Bluegrass Films and distributed by Universal Pictures. A Million Ways to Die in the West was released via DVD and Blu-ray on October 7, 2014. The Blu-ray release contains an unrated version (135 minutes), along with the original theatrical cut (116 minutes). In the United States, the film has grossed $8,336,420 from DVD sales and $6,739,162 from Blu-ray sales, making a total of $15,075,582. A Million Ways to Die in the West received mixed reviews from critics. Review aggregation website Rotten Tomatoes gave the film a 33% rating based on 192 reviews, with an average score of 4.9/10. The site's consensus states, "While it offers a few laughs and boasts a talented cast, Seth MacFarlane's overlong, aimless A Million Ways to Die in the West is a disappointingly scattershot affair." Another review aggregation website, Metacritic, gave a score of 44 out of 100, based on reviews from 43 critics, indicating "mixed or average reviews". Audiences surveyed by CinemaScore gave the film an average grade of "B" on an A+ to F scale; opening weekend demographics were 55% male and 72% over 25 years of age. Scott Mendelson of Forbes commended MacFarlane's decision to make an unconventional western comedy, but summarized the film as "just ambitious enough for that to be genuinely disappointing." Michael O'Sullivan at The Washington Post was mixed, deeming the film a "broad, wildly hit-or-miss satire," remarking that he found few of the jokes in the film funny. "Spiritually, it's closer to a mid-range crowd-pleaser such as City Slickers than Blazing Saddles, too enamoured of genre convention to reach for the comic dynamite," wrote Mike McCahill at The Guardian. ^ "A Million Ways to Die in the West". British Board of Film Classification. May 19, 2014. Retrieved May 20, 2014. ^ "Box-Office Preview: 'Maleficent' Set to Curse 'Million Ways to Die in the West'". The Hollywood Reporter. May 28, 2014. Retrieved May 29, 2014. ^ a b c "A Million Ways to Die in the West (2014)". Box Office Mojo. IMDB. July 20, 2014. Retrieved November 28, 2015. ^ Shaw-Williams, Hannah (February 3, 2014). "'A Million Ways to Die in the West' Trailer Has a Whole Lot of Death". Screen Rant. Retrieved February 5, 2014. ^ a b "Liam Neeson & Giovanni Ribisi Join 'A Million Ways to Die in the West'". Screen Rant. Retrieved August 10, 2013. ^ Quinlan, Erin (May 21, 2014). "Neil Patrick Harris taps 'stache of talent in 'Million Ways to Die'". Today. ^ a b "Rex Linn Joins Seth MacFarlane's 'A Million Ways to Die in the West'". The Hollywood Reporter. May 30, 2013. Retrieved August 10, 2013. ^ "Wes Studi to Be Second American Indian Inducted into 'Hall of Great Western Performers'". Indian Country Today Media Network. April 19, 2013. Retrieved May 27, 2014. ^ Morgan, Maybelle (May 29, 2014). "ELLE reviews A Million Ways to Die in the West". Elle. Archived from the original on May 29, 2014. Retrieved May 29, 2014. ^ a b "A Million Ways to Die in the West" (PDF). Universal Pictures. May 9, 2014. Archived from the original (PDF) on May 24, 2014. ^ a b "SethMacFarlane: Great day of filming with the hilarious Gilbert Gottfried @RealGilbert on #AMillionWays". Twitter. February 21, 2014. Retrieved February 22, 2014. ^ Vejvoda, Jim (March 25, 2014). "Universal Shows Off Fifty Shades of Grey, Lucy, A Million Ways to Die in the West and More at CinemaCon". IGN. Retrieved May 22, 2014. ^ a b "@billmaher brought the laughs today in A Million Ways To Die In The West". Twitter. May 29, 2013. Retrieved January 30, 2014. ^ a b c d e Alexandra Cheney (April 29, 2014). "Seth MacFarlane on 'Million Ways to Die' and Taking Projects That 'Terrify' Him". Variety. Retrieved May 29, 2014. ^ a b David Fear (June 5, 2014). "The Cowboy Flicks That Shaped Seth MacFarlane". Rolling Stone. New York City: Wenner Media LLC (1210): 18. ISSN 0035-791X. ^ "Seth MacFarlane Finds A Million Ways to Die in the West". ComingSoon.net. December 3, 2012. Retrieved May 11, 2013. ^ "Charlize Theron Eyes A Million Ways to Die in the West". ComingSoon.net. January 30, 2013. Retrieved May 11, 2013. ^ "Charlize Theron 'begged' for a part in comedy western 'A Million Ways To Die In The West'". The Independent. June 4, 2014. Retrieved June 6, 2014. ^ "Amanda Seyfried Finds A Million Ways to Die in the West". ComingSoon.net. February 11, 2013. Retrieved May 11, 2013. ^ "Giovanni Ribisi and Liam Neeson Find A Million Ways to Die in the West". ComingSoon.net. March 6, 2013. Retrieved May 11, 2013. ^ Chan, Anna (May 19, 2014). "Liam Neeson admits he blushed reading 'A Million Ways to Die in the West' script". Today. Retrieved May 20, 2014. ^ "Sarah Silverman Eyes A Million Ways to Die in the West". ComingSoon.net. March 18, 2013. Retrieved May 11, 2013. ^ "Universal and MRC Board Seth MacFarlane's A Million Ways to Die in the West". ComingSoon.net. Retrieved May 11, 2013. ^ "On The Set For 5/13/13: Melissa McCarthy Co-Directing 'Tammy' For New Line Cinema…'Low Down,' Ghosts of the Pacific'". Studio System News. May 13, 2013. ^ Heisel, Angela (April 3, 2013). "The New Mexico Film Office Announces "A MILLION WAYS TO DIE IN THE WEST" to film in New Mexico" (PDF). New Mexico Film Office. ^ MacFarlane, Seth (April 23, 2013). "Filming A Million Ways to Die in the West. Fun being in a climate where you have to drink 9,000 glasses of water a day or you drop dead". Twitter. ^ Gomez, Adrian (May 12, 2013). "Star-studded N.M. offers TV series, movies new incentives". ABQjournal. ^ MacFarlane, Seth (August 9, 2013). "Last day of filming on A Million Ways to Die in the West -- thanks to a cast and crew as talented as they are tireless". Twitter. ^ "'A Million Ways to Die in the West' Soundtrack Details". Film Music Reporter. May 13, 2014. Retrieved May 22, 2014. ^ Staskiewicz, Keith (April 28, 2014). "Seth MacFarlane's galloping theme song for 'A Million Ways to Die in the West': Hear the Alan Jackson tune -- EXCLUSIVE". Entertainment Weekly. ^ Taylor, Amanda (May 10, 2013). "'A Million Ways to Die in the West' gets summer 2014 release date". Entertainment Weekly. Retrieved May 11, 2013. ^ Keegan, Rebecca (May 23, 2014). "Seth MacFarlane, Charlize Theron find common ground in 'West'". Los Angeles Times. Retrieved December 7, 2014. ^ Couch, Aaron (January 2, 2014). "First Look at Seth MacFarlane's 'A Million Ways to Die in the West' Revealed (Photo)". The Hollywood Reporter. Retrieved December 7, 2014. ^ "A Million Ways to Die in the West". Media Rights Capital. Retrieved May 26, 2013. ^ Collura, Scott. "Sarah Silverman for MacFarlane's A Million Ways to Die in the West". IGN. Retrieved May 9, 2013. ^ "Weekend Box Office Results for June 6-8, 2014". Box Office Mojo. Retrieved June 17, 2014. ^ "Weekend Box Office Results for June 13-15, 2014". Box Office Mojo. Retrieved June 15, 2014. ^ "Weekend Box Office Results for June 20-22, 2014". Box Office Mojo. March 7, 2014. Retrieved July 4, 2014. ^ "A Million Ways to Die in the West Blu-ray". Blu-ray.com. Retrieved July 20, 2014. ^ "A Million Ways to Die in The West – Summary". The Numbers. Retrieved December 12, 2014. ^ a b "A Million Ways to Die in the West Reviews". CBS Interactive Metacritic. Retrieved May 30, 2014. ^ "A Million Ways to Die in the West". Flixster Rotten Tomatoes. Retrieved October 26, 2014. ^ Ray Subers (June 1, 2014). "Weekend Report: 'Maleficent' Casts Box Office Spell, 'Million Ways' Dies". Box Office Mojo. Retrieved June 12, 2014. ^ Claudia Puig (May 29, 2014). "'A Million Ways to Die' (laughing) in the West". USA Today. Retrieved May 29, 2014. ^ Stephen Holden (May 29, 2014). "A Frontier Farce From the Guy Behind 'Family Guy'". The New York Times. Retrieved May 29, 2014. ^ Andrew O'Hehir (May 29, 2014). ""A Million Ways to Die in the West": How Seth MacFarlane became the new Adam Sandler". Salon. Retrieved May 29, 2014. ^ Rafer Guzman (May 28, 2014). "'A Million Ways to Die in the West' review: Crass but funny". Newsday. Retrieved May 29, 2014. ^ Scott Mendelson (May 29, 2014). "Review: Seth MacFarlane's 'A Million Ways To Die In The West' Shoots Blanks". Forbes. Retrieved May 29, 2014. ^ Michael O’Sullivan (May 29, 2014). "'A Million Ways to Die in the West' movie review". The Washington Post. Retrieved May 29, 2014. ^ Mike McCahill (May 29, 2014). "A Million Ways to Die in the West review – more City Slickers than Blazing Saddles". The Guardian. Retrieved May 29, 2014. ^ Michael Phillips (May 29, 2014). "Review: 'A Million Ways to Die in the West' 1/2 star". Chicago Tribune. Retrieved May 29, 2014. ^ Richard Corliss (May 28, 2014). "REVIEW: A Million Ways to Die in the West, but Few Ways to Laugh". Time. Retrieved May 29, 2014. ^ Scott Foundas (May 28, 2014). "Film Review: 'A Million Ways to Die in the West'". Variety. Retrieved May 29, 2014. ^ Rene Rodriguez (May 29, 2014). "'A Million Ways to Die in the West'". Miami Herald. Retrieved May 29, 2014. ^ John DeFore (May 28, 2014). "'A Million Ways to Die in the West': Film Review". The Hollywood Reporter. Retrieved May 29, 2014. ^ Joe Morgensternn (May 29, 2014). "'We Are the Best! ': Delicious Discord in the Key of Life". The Wall Street Journal. Retrieved May 29, 2014. ^ Toomey, Alyssa (November 4, 2014). "Jennifer Lawrence, Shailene Woodley and Robert Downey Jr. Among People's Choice Nominees, Plus Find Out Who's Hosting!". E! Online. Retrieved November 8, 2014. ^ "IFMCA: the International Film Music Critics Association » IFMCA Winners 2014". Filmmusiccritics.org. Retrieved February 19, 2015.